Aimersoft DVD Ripper for Mac can rip DVD to various video formats (including MP4, AVI, M4V, MOV, 3GP, MPG, FLV) and audio formats (MP3, M4A, AAC, WAV, OGG, APE, etc.) on Mac OS. This best Mac DVD Ripper let you rip DVD on Mac with excellent video and audio quality. You can select the subtitle and audio track you want, also trim video, crop movie and merge multiple DVD chapters into one.Support photo capturing and save as jpeg, bmp. MAC OS X or above operating system, At least 512M physical RAM, 1G Hz Intel or PowerPC processor. Although Aimersoft DVD Ripper software is very powerful, Aimersoft DVD Ripper for Mac is still easy to use. You can finish converting DVD to AVI or other formats with just a few clicks. 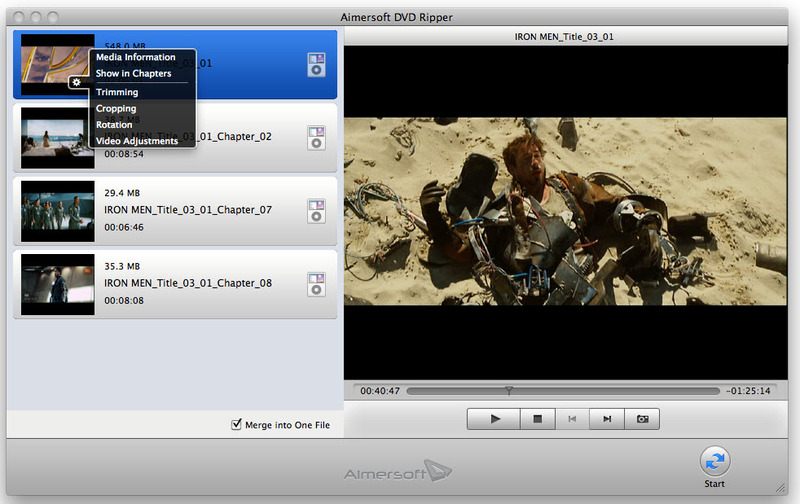 Now download Aimersoft DVD Ripper for Mac for free and enjoy your DVD movie without limitation of DVD disc. 1. Perfectly compatible with all Mac OS X. 3. This best Mac DVD Ripper can rip all of your DVD movies with excellent video and audio quality. - better than any other Mac DVD Ripping software. Qweas is providing links to Aimersoft DVD Ripper for Mac 2.0.0 as a courtesy, and makes no representations regarding Aimersoft DVD Ripper for Mac or any other applications or any information related thereto. Any questions, complaints or claims regarding this application Aimersoft DVD Ripper for Mac 2.0.0 must be directed to the appropriate software vendor. You may click the publisher link of Aimersoft DVD Ripper for Mac on the top of this page to get more details about the vendor.